Neurergus crocatus has been kept in captivity for several years. Probably all animals now in captivity originated from a single import in 1990 from Iraq (RADSPIELER, 1990). These newts were gathered in Kurdistan, in the vicinity of Aqra in Iraq. Due to the precarious political situation since then, it is practically impossible to study or visit this habitat any more. Therefore, it is unlikely that the present supply of newts can be supplemented. Despite the enthusiastic efforts of devoted terrarium-keepers, there have been few successful breedings and only decreases in the groups. The number of animals maintained decreased so dramatically, it was feared that the species would become extinct from the hobby. 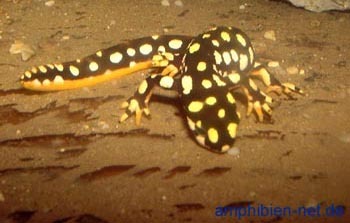 For this reason, Neurergus crocatus became the "flagship" species of the AG Urodela Newt Registry. Now significant effort will be required to keep this newt species viable in captivity. All keepers of this newt, which has now become extremely rare in our hobby, are therefore asked to participate in our breeding program. The genus Neurergus with its 4 species (crocatus, strauchii , kaiseri, microspilotus) lives primarily in the area of the settlement zone of the Kurdish ethnic group. 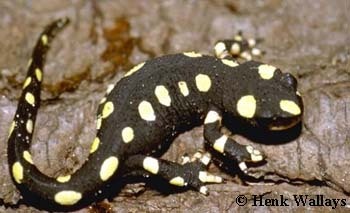 From this fact comes the German common name: Kurdische Bergbachmolche (Kurdish mountain brook newt). N. crocatus occurs in the most southeastern corner of Turkey (Hakkari), in the northern area of the Zagros Mountains in Iraq, and in the Zagros mountains of Iran up to Urmia Lake. The range of the species therefore lies in a politically unstable zone. Traveling in these countries for scientific purposes is problematic, if not impossible. Neurergus crocatus, like its sister species, is quite closely related to the Euproctus species. Thus, it is an inhabitant of flowing water. In the course of substantial geological upheavals (changes in mountain elevations, drainage, etc. ), the species has adapted itself to gradually changing conditions. Only mountain brooks have remained as constantly inhabitable bodies of water in the range of this species; thus it had to adapt itself to this habitat, and did so very successfully. However, this could not prevent the species from being restricted into extreme locations. Most small streams have become, to a large extent, isolated. The land bridges between the animals are no longer surmountable. Therefore, we find single populations that are potentially vulnerable in the long-run due to their isolation. One imagines, for example, the outbreak of an infection. Or, worse, habitat destruction by humans. We have virtually no data on the present population status of the species, but on the basis of the limited occurrence of water and the ruling climatic conditions, it can be inferred that any water body once lost for the species could hardly ever be naturally repopulated. Neurergus crocatus lives in streams that are characterized by a steep descent and thus a strong current. Except for the piled rock walls in the villages, the environment of the streams is mostly rocky and almost completely free of vegetation. In lower areas, the streams are shaded by a few shrubs. Frequently they are exposed to full sun exposure and usually dry up at the end of spring. In the winter, on the other hand, there are large amounts of snow that quickly melt in March/April and lead to violent floods. During this flooding, the animals’ streams are unusable. The animals would immediately be swept away. When quieter pools form between slowly flowing areas, first the males and later the females enter the water. The mating and subsequent embryonic and larval development must proceed comparatively quickly, because the waters frequently dry up during the summer and are no longer usable. The high intensity of the sun exposure also favors such rapid development. First the males, later the females, and finally the juveniles leave the water and find refuge in rocks and in the piled rock walls. Here they probably spend the hot season, probably with little activity. Because there are hardly any data on the life cycle of Neurergus, and notes on the habitat are usually limited to short on-the-spot notations, the statements made in this text contain some speculative interpretations of the situation observed in connection with the corresponding geological and climate data. Observations made in captive conditions supplement these speculations and, at least partially verify them. Due to the size of the animals, a terrarium for the terrestrial period should be 60-100 cm long for a group of 4-5 animals. This may seem like tight quarters, but one must consider that the animals need to move around remarkably little. Furthermore, it is important to guarantee the necessary density of feeder animals. In too large an enclosure, the possibility of starving is a real and serious danger! For shelter, there should be limestone rocks. Importantly, the setup should be made such that it is always possible to inspect the animals. Although these newts are quite resistant to drying, it is necessary to check and regularly control the correct humidity. This can be accomplished by spraying, by putting some stone structures over damp foam material, or by having a water level of a few millimeters at the bottom. The author prefers the foam material method because it provides longer-term stabilization of the moisture level and no animals can drown. Interestingly, most adult Neurergus hardly ever leave the water, similar to some Triturus. It is possible that the animals only exhibit this behavior because their natural waters regularly dry up. This willingness to stay in the water tempts the keeper to take advantage of simpler care in captivity. Thus the land-dwelling stage is missing or drastically abbreviated. However, this may have a negative influence on the cyclic gonadal development and therefore jeopardize breeding success thereafter. This simplification of care therefore does not comply with the goals of species-specific captive care. The aquarium for the aquatic period can be considerably larger than that for the terrestrial period. In the water phase, the animals are agile and frequently moving. A strong filter whose outlet splashes over the surface is indispensable. The resulting water velocity may even be strong enough to force the animals to struggle against the current to prevent being swept away. However, for the nuptial dance and egg-laying, there also needs to be quieter zones. The water depth should be to at least 15 cm, but should not exceed 30 cm. Water that is alkaline and hard (high in carbonate) most closely corresponds to the natural conditions. Neurergus crocatus has a distinct winter hibernation. The safest and simplest way to offer this is a refrigerator. The temperature should stay between 4 and 5°C. Higher temperatures do not allow the metabolic rate to fall low enough. The animals would consume energy, but not eat enough to fill up during this phase. As a result, they would become emaciated and could hardly reproduce. A favorable way to accommodate the animals is individually in plastic boxes with perforated covers. Several layers of damp paper towels are spread on the bottom of the boxes. As a shelter, some limestone chunks serve best. The containers must be monitored regularly, because there is a high danger of drying in the refrigerator. As required, the paper towels are re-wetted. Excrement and pieces of shed skin are removed at this time. 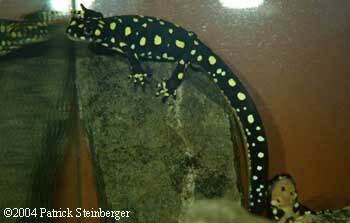 Feeding: the food requirements of Neurergus are quantitatively lower than that of some other salamanders. Because the animals grow slowly and therefore do not eat very much, it must be made certain that the food offered is varied and high in nutritional value. Therefore the live food given must be well-fed (gutloaded) to maximize its nutritional value. This particularly applies to commercially-available crickets. Beyond this, all relevant food sources that are available should be utilized. Unfortunately, many Neurergus on land refuse to eat earthworms, which would be readily accepted in the water. Insects and their larvae are obviously preferred foods. There have been no stomach analyses of wild caught animals. Offspring: as already mentioned, after some initial successes during the first few years, no more recent captive breedings have been reported for quite a while now. This means that the species has become very rare in captive care. Each keeper therefore should do as much as possible to offer the animals conditions that permit reproduction! 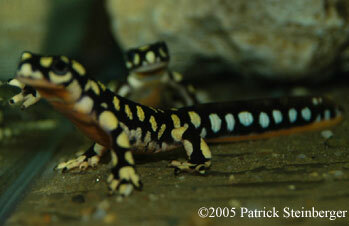 After the winter hibernation, the newts are kept in aquariums as described above. The water temperature should be 12-15°C. For egg deposition, one should provide piles of rock and slabs that offer crevices small enough for the animals to just slip through and overhangs (projections) in form of slabs protruding from the rock piles. These structures serve as sites for egg deposition, as females often “glue” their eggs into these crevices or to the undersides of overhanging rocks. Often, all the eggs are attached at the same place so that a regular “nest” emerges. In order to prevent the animals from preying on their own eggs, the spawn should be moved regularly to another container. The number of eggs per female usually does not exceed 50-60. The water in the hatching tank must be kept moving with a current by means of filter, as the eggs in the natural habitat develop in flowing water. In order to prevent intake of the newly-hatched larvae, either use a sponge filter or cover the inlet of the filter. Artemia and/or Cyclops are appropriate first foods for the larvae. They start to feed a few days after hatching. As the animals grow, one can switch to larger food organisms. After 3-4 months, the animals reach metamorphosis, and are then maintained on land. Sexual maturity is reached after 4-5 years. During the development to adulthood, there are often major problems at a certain point in development. Shortly before reaching sexual maturity, the subadults suddenly become very weak, get sick, and usually 100% of them die in a few weeks. The cause for this is unclear. It is possible that in this phase, a hormonal change in the total physiology of the animals is accompanied by a temporary immune weakness. The Aeromonas infections that have been diagnosed in these cases were caused by germs that ordinarily wouldn’t harm the animals. Macroscopic symptoms on the dead animals, if visible at all, are slightly bloodshot spots on the undersides of the feet. The animals will usually be found dead in the setup without any externally-recognizable cause. It is usually too late to initiate treatment for the remaining animals. The infections have not been known to spread to other salamanders. In this way, the author has twice lost his complete batch of offspring of N. crocatus (8 and/or 14 animals). On a third occasion, the animals were isolated from one another at the first signs of this illness and kept for several weeks on paper towels soaked with a wide spectrum antibiotic solution, changed every three days. For 4 of the 6 animals, the aid came too late, but 2 survived under these conditions, showing no further symptoms and reaching adulthood without problems. Because this phenomenon happened in a similar manner to a number of keepers under somewhat different conditions, this seems to be a specific characteristic of N. crocatus. Up to now, most captive bred offspring have fallen victim. In the future, special attention will be dedicated to this problem! The studbook of Neurergus crocatus currently contains less than 30 animals, which live in various small groups with several European keepers. There were no more breedings or offspring in 2001 or 2002. Therefore, it will take the good will of all keepers of this species to bring together enough animals for viable breeding units and, in a joint effort, prevent this species from becoming extinct in captivity. Those marked with * contain direct references to Neurergus in the pages marked in [ ]. BHATNAGAR, A. N. & T. YONISS (1973): Karyotype of an urodele, Neurergus crocatus Cope.-Proc. Nat. Acad. Sci., India, 43: 201-202. GORGEES, N. S., A. Y. YACOB & L. J. RASHAN (1977): Observations on the Lateral-Line Sense Organs of the salamander Neurergus crocatus crocatus Cope (Amphibia: Urodela).- Gegenbauers morph. Jahrb., Leipzig, 123: 621-637. TEUBER, N. (1990): Erste Erfahrungen mit der Haltung und Nachzucht von N. crocatus.- Urodela Info, Bochum, Offenbach, 1: 5. VENZNER, G. (1922): Neues Verzeichnis der Amphibien und Reptilien von Kleinasien.- Zool. Zeitschr., ?, 1: 81-121. WERNER, F. (1902): Die Reptilien- und Amphibienfauna von Kleinasien.- Sb. Acad. Wiss. Wien, math. nat. Kl., 111: 1057-1121.